AboutAran.com: Stories from Árainn of wartime love, incredible endurance and heroic rescue. Stories from Árainn of wartime love, incredible endurance and heroic rescue. incredible endurance and heroic rescue. When identifying people and places in old photographs, one can often uncover some very interesting stories from the past. Thankfully, some of these stories were documented in newspaper reports at the time and exist in the archives. Other stories exist only in the fading memories of the people who lived through them more than half a century ago. The following photograph, dating from the 1930s or 40s, has many stories attached to it. The St. Columba Hotel was sold and later run as "The American Bar" by the Connolly and O'Toole families. Today it is known as "The Bar". We got the photo from George Guest, a nephew of Eileen Gill, who had kept the photograph, all her life, displayed in a homemade frame. The most likely date for the photo is sometime in the 30s or 40s. Why Eileen had framed and cherished it all those years, nobody knows. Eileen was a generous, lively and courageous lady from Cill Rónáin. Recently, a young Eileen was featured in a TG4 documentary about a body found in a railway tank, washed ashore on the South Island during World War 2. True to character, Eileen was the first to volunteer to climb in and remove the poor man. Not long before she died in December 2000, Eileen was asked who the people in the photo were and she identified the man on the left as Willie Gorham of Cill Rónáin and the man on the extreme right as a visiting teacher who was learning Irish. Like most Gaeltacht people of those days, she humorously referred to teachers like him as a, "Lá breá" (fine day). As they could initially speak very little Irish, those two words were all the conversation one could get out of them. Amusingly, “Lá breá” was the salutation even if the seagulls were grounded because of driving rain, and the sea was breaking over the cliffs at Dún Dúchathair (The Black Fort). The photograph of Willie Gorham and others standing in front of the St. Columba hotel is linked to a story of wartime love, endurance and heroism. Alfred Smith had been born in India, where his father was stationed. He later rose to the rank of Major in the British Army and fought in the Great War of 1914-18. After being injured, Alfred ended up recovering in a hospital in the north of Ireland. While recovering, he fell in love with his nurse, May Cloherty (from Galway town), and in 1916 they married. 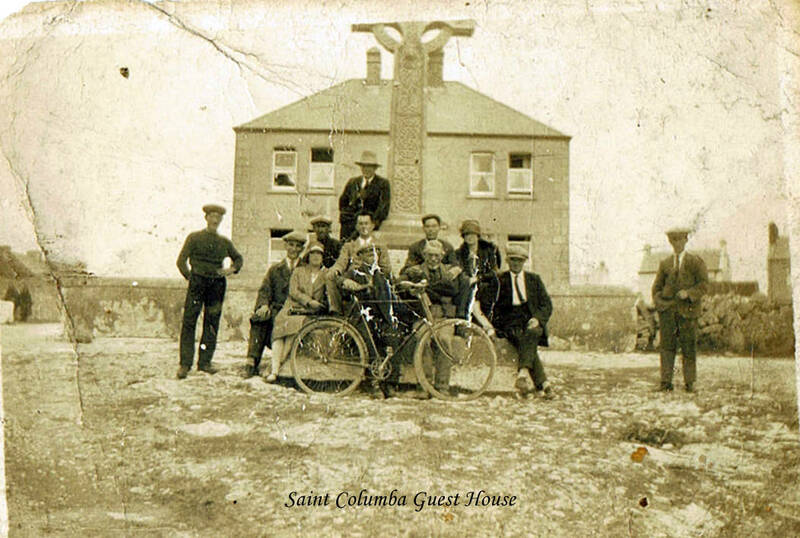 When Alfred retired, he and May moved to Árainn in 1921 and took over the running of the St. Columba hotel and bar (featured in the old photograph). He also worked as an agent for the British steam trawlers which called regularly as well as serving as Galway County Council's rate collector. Before the First World War, Alfred had been an outstanding soccer player with the famous Bohemians amateur club in Dublin and had played centre half for Ireland as an international player. He had been signed from the Northern Nomads, a well known English amateur side and, after his military career brought him back to England, he continued to travel over to Ireland to play with Bohemians. He and two of his comrades at Bohemians had written home from the war in 1914, telling their team mates that they expected to be home to play again before the season ended. Like many another soldier, on both sides of that terrible slaughter, their hopes for a short war were unduly optimistic. 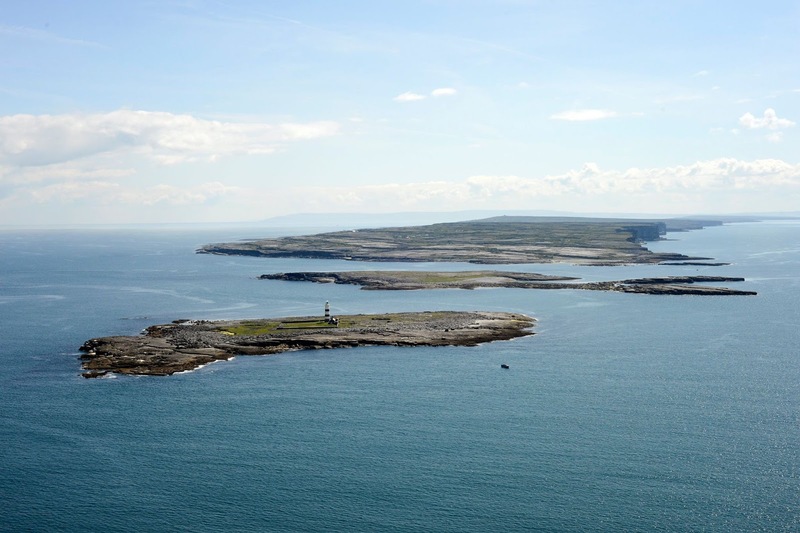 The story of Alfred Smith leads us to a small windswept, uninhabited island at the very western end of Árainn, called Oileán Dá Bhranóg. In the photographs below, the little island can be seen under a blue sky on a fine day, and on a dark and stormy day with rough seas. Early on the 12th April 1926, four or five currachs landed there to cut and gather seaweed. There were just two boats still at the island when they noticed the sea getting up. They rushed to their currachs but, even before they reached the mouth of the Calladh, the waves coming down the Bealach were beginning to break. The leading boat, owned by a descendant of Connemara poitín (moonshine) makers and for whom turning back was never an option, managed to battle on and reached the safety of Bun Gabhla shore. The second boat, manned by Seánín Thomás Ó Maoláin and his teenage son, Seán Tom, wisely turned back and just barely reached the safety of the small island. They found themselves marooned there with only a damaged, upturned currach for shelter. For the next four days they managed to forage on the shore for seafood and got some water from pools in the rocks above high water. On the 16th April they managed to attract the attention of a passing Scottish steam trawler, the S.T. Leukos, but the seas were too rough to attempt a rescue. Just how big the seas were can be gauged from the fact that the men of the West were unable to launch a rescue from Bun Gabhla shore even though these men were among the most experienced currach men in Ireland, living where the next landfall was the island of Newfoundland in Canada. The wise council of some of the older men, and probably all of the women, may have prevented a currach crew from being lost in an attempted rescue. Launching and landing at Bun Gabhla is extremely dangerous due to the strong tides and rocky shore. The local currach men's incredible boat handling skills were shown to the entire world a few years later when Robert Flaherty made his great film, "Man of Aran". In the 1970s, the late George Stoney film "How the myth was Made", dealt with the making of the 1934 film “Man of Aran". There was some mild controversy when some suggested that director Robert Flaherty had exaggerated the amount of physical work the women of Aran did in days gone by. It is worth noting that an old man has recalled that the currach that managed to battle home as the storm broke, was "manned" by Patch Sheáin Uí Thuathail and his daughter. Proof indeed that cutting seaweed and rowing a boat was no problem for that generation of Aran women. Those who have read the recently published memoir of Patch Sheáin's grandson, Padraig O'Toole, will be familiar with this part of the island. Pat has written a very warm and amusing account of growing up around these shores in the 1940s and 50s. An older generation of Islanders are brought alive once more , if only for the duration of the reading. His book is called "Aran to Africa" and is available from Amazon, Charlie Byrne's and all good bookstores. 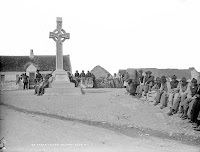 Proceeding to Cill Rónáin, the S.T. Leukos reported their sighting and Alfred Smith organised a rescue attempt. Realising that a landing might prove impossible, Alfred prepared a barrel containing food and drink. Returning by steam trawler to the scene, they launched a currach and attempted to land but were driven back by mountainous seas breaking on the rocky shore. They managed, however, to launch the barrel with the food and drink and were delighted to see one of the marooned men retrieving it from the surf as it drifted ashore. Given that he had old shrapnel wounds to his lungs, Alfred should not really have been on board at all but his competitive spirit and decency probably overruled good sense. 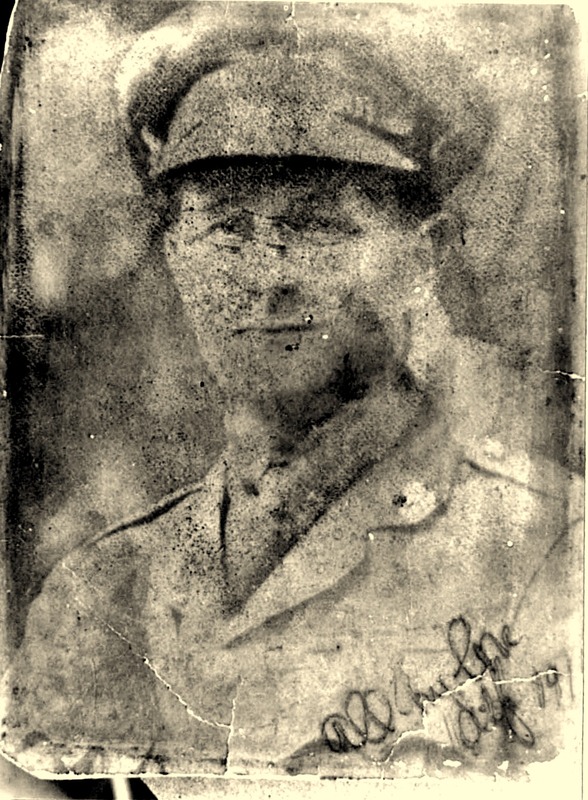 Alfred had been decorated during the war and his instincts as a centre half and a soldier would have made him want to get close to the action. One newspaper report mentions Alfred Smith falling, while on board the trawler, and aggravating the old war wound; another newspaper report says that he caught double pneumonia from the drenching. The fall and pneumonia were undoubtely contributing factors when, sadly, he died about a week after the incident. A love story that began with a girl from Galway doing her best for an injured soldier was to end with that same soldier doing his best for two stranded men of Árainn. Alfred Smith was only 36 years old when he died. Finally, on the 18th April 1926, a Welsh trawler, the S.T. Onetas, made another attempt to rescue the stranded father and son. They launched a currach with three crew and, at great risk, succeeded in rescuing the men. The three oarsmen were Willie Gorham (from the 1940s photo), his neighbour, Josie Doyle, and a local Garda, Edward Carey. All three were later rewarded for their efforts. The late Major Smith's surviving family, and the skippers of the trawlers were also sent letters of thanks by the minister for industry and commerce, Derry man, Patrick McGilligan. The two stranded men may well have survived without any intervention, as the Ó'Maoláins were a tough breed, but this does not take from the unselfish efforts of others to help them. Josie Doyle and Willie Gorham featured in many other rescues, as they later served on the new lifeboat, which was established in 1927 under the command of Coxswain John Gill. This rescue and the loss of two trawlers between Slyne head and Clare Island the previous year had highlighted the need for a proper lifeboat station on the West coast. Those other stories are for another day. When Alfred died, May Cloherty found herself with four sons to raise: Paddy, Arnold, Wyndham and Freddie, the youngest, who was just five years old. She sold the hotel and managed to get her sons educated at the Duke of York Royal Military Academy in Dover where she herself got the job as Matron. Like their father, who had also once been at school there, all four spent time in the military. The three eldest survived being prisoners of war during World War 2. Paddy and Arnold were held by the Germans, and Wyndham by the Japanese. After the fall of Singapore, Wyndham found himself working on the infamous "death railway" which killed so many of his comrades. Freddie spent most of his life with the Irish army and settled in the South Galway town of Gort Inse Guaire (Gort). Older readers may remember when he served as masseur with the famous three in a row Galway football team of the 60s. Their mother, May, later went to Belfast and helped the great northern politician, Joe Devlin, in looking after the welfare of poor Catholic girls during troubled times. She later returned to Árainn and lived out her life in a beautiful rose-filled cottage in Cill Rónáin which is now, alas, derelict. May died suddenly in 1961 in Árainn, while Wyndham was on board a ship, emigrating to New Zealand. She was buried beside Alfred in Relig Chill Éinne, a graveyard by the sea at the eastern end of Árainn. Many Islanders still remember May as a friendly, stylish woman whose only weakness was a love for nice hats. Wonderful timeline here of Alfred and his historical life journey. I am always amazed how one or two decisions can have such a huge impact on, at the least, one's own life, but more often that of so many others. The 'Men and Women of Aran' adds some great references--had not heard of "How the myth was Made". I truly enjoyed this and look forward to reading more AboutAran.